Did you know that there are regulations of certain regattas forcing every crew member of a boat to carry a sailing knife when on deck? So, despite the fact that most of my sailing friends are assuring I´ll never need such a tool, there must be something to it for official bodies to require having them at dispense. But what is a sailing knife good for and which one to choose from the big variety of available products? Here´s what I gathered about that topic. Every Skipper needs one. Why? Since sailors do roam the seas they did have a number of jobs which required having a convenient, small but crafty tool at hand. Opening up knotty ropes, cutting down cords, splicing new eyelets or just having a tool to help eating the daily ration of hard dried fish and stuff. Besides, back then in the Golden Ages of Sail it was not uncommon amongst the mostly shanghaied crews to have fights which could escalate to bloody skirmishes. A knife was the then solution to everything. Well. Of course. A modern day yacht skipper is rarely engaged in a fist-fight nor would he eat his daily meal out of a smelly bowl and have to cut away a finger thick cover of fungi from moldy old bread. But there are definitely some features even in our days a modern sailing knife is made for: Safety is on top, to have a crafty tool for frequently incurring tasks s second. Obviously, the sailing knife´s design did change over the course of the centuries. A once long shaped cork handled weapon turned into a handy small precision tool with fluorescent grabs. What didn´t change too much was its three main purposes. Knives are for cutting things. Period. And it’s the same with sailing knives. There are occasions when there is no other way to solve a situation by just simply cutting a rope. Harness Rescue is a big thing here: When a skipper goes over board and clings to his lifeline it may hurt more than it may help. Being dragged by a yacht with more than 4 knots could in some circumstances drown the MOB. Sometimes it’s the better way out to just cut that lifeline and not being dragged and pushed under water. Same with capsizing or worse, sinking: Being connected to the boat in that situation could mean to be forced to remain underwater – the harness could hinder reaching the surface. Cuts through Rope like butter: The short sharp serrated Blade. Having a sharp blade at hand to quickly cut the rope is a way out. 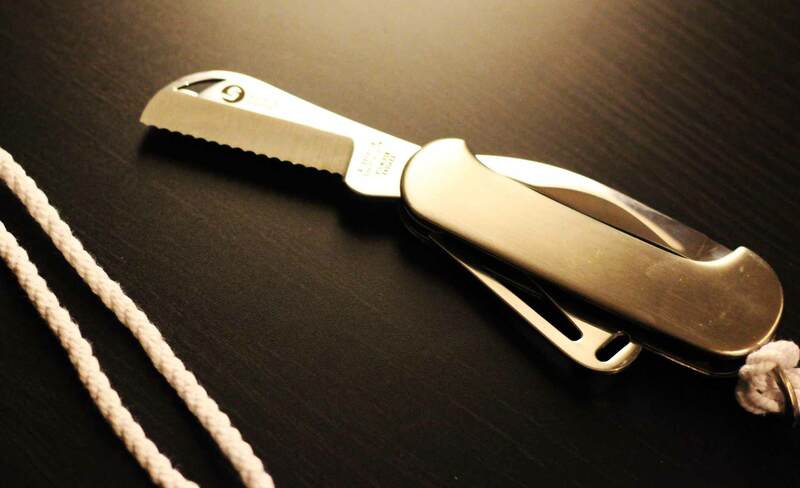 That’s the main feature of a modern day sailing knife: A very strong, short and in most cases serrated blade that will go through a rope like butter. A safety feature could be a rounded tip (we don´t want to stab a fellow crewmate) or a blade-lock for preventing folding blades to snap off a finger or two. The blades should me made of a high grade stainless steel and at the same time demagnetized to not disturb the compass of your yacht. Sharpening and cleaning the knife should be made easy as well as a strong and reliable mode of connecting the tool to your oilskin – whether you like to carry it at your belt or in a pocket of your jacket on a one or two feet long cord. Shackles are used virtually everywhere on a boat. And who doesn´t know a few of those situation when you need to open one – maybe to turn free a halyard for immediate use – and it is just jammed? Maybe because the halyard has been fixed with too much force on the shackle or maybe the rope hasn´t been in use for a longer period and the shackle just jams. 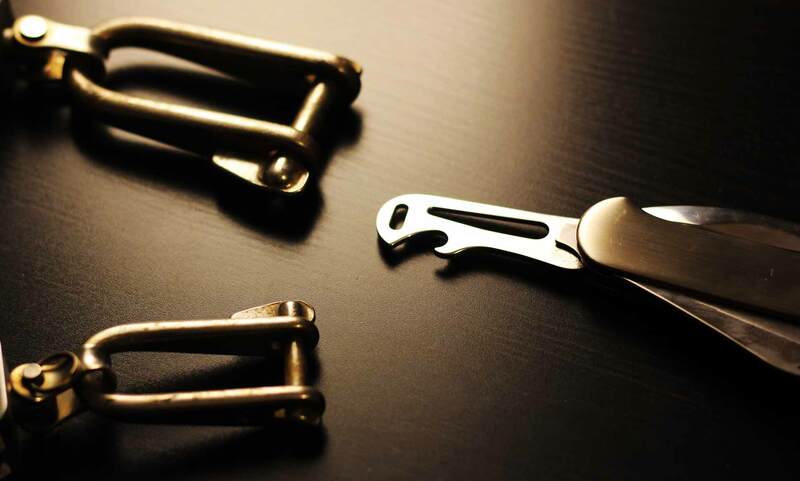 In either case you´d have to be a very strong man to open the shackle – sometimes you would just need mechanical help top open it. 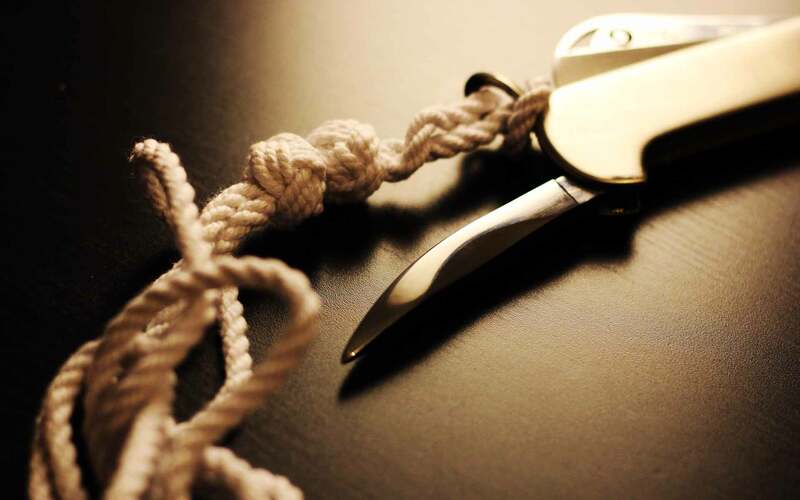 That´s where to sailing knife comes into play: Most of them do feature a separate shackle blade. Can open up rusty jamming Shakles with ease. It´s a blade that cannot cut but has different slots for fitting different sizes of shackles. You´d just open the bolt by applying the right slot and utilizing the leverage effect on the shackle. Comparable to opening a bottle of beer the shackle will turn open in a matter of seconds. A very useful tool given the instance that you are on the fore deck in the midst of aggressive moving seas fiddling around and not having the time to go back to have a look into the starboard locker to find a proper tool: You´d just grab into your pocket, have the shackle blade and open the damn jamming thing. Marlinspikes are rarely used these days however it is good to have such a tool at hand when needed. Basically a marlinspike would help a sailor do his rope work: Untying ropes and deranged lines such as may occur during or after a hot situation in a regatta or a high-tensioned storm or to open ropes to their different smaller lines when eyes are formed (connecting ropes, lengthen ropes or form eyes). That is a kind of work a normal skipper wouldn´t perform nowadays unless he is on a solo circumnavigation and runs out of spare rope. I rarely reed of marlinspikes in my books of Moitessier, or Knox-Johnston but I do not know a single sailor at present who would tell me he has a frequent use of the marlinspike. Nevertheless, it´s good to have it. The market of sailing knives is as full as you would imagine. There are a load of brands, different styles and appearances of knives and of course the respective internet forums are full of vivid discussions on which knife is the best. As being a more conservative skipper I opted for a well-known brand – in fact, Ibberson is established since 1700, unbelievable! – and a well proven knife design. My Ibberson Sailingknife has three foldable Tools. My Ibberson Off Shore Yacht Knife features all you´d expect from such a tool. The blade goes easily through both natural hemp-based rope as well as through synthetic fibres. 80 Euros is not a bargain, really, but the material and craftsmanship is extra-heavy and all in all the knife feels sturdy and of a quality as if I could pass this tool over to my children and their grandchildren. 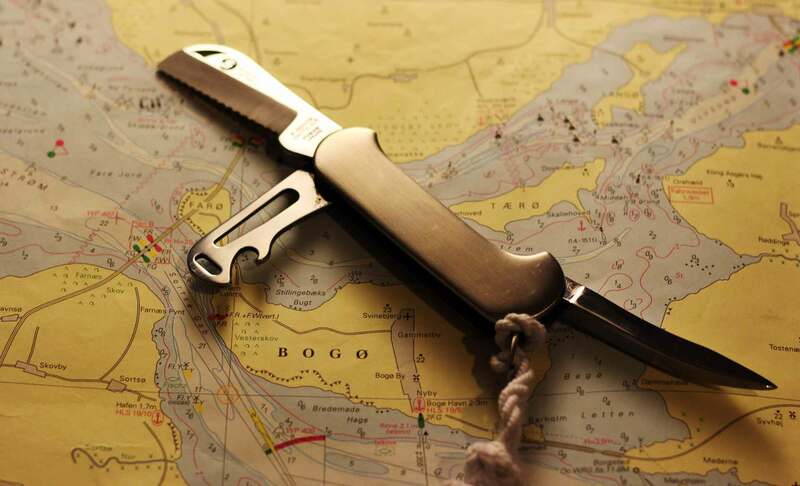 Do you have a sailor´s knife on board and do you used it frequently? Looking forward to your comments. thanks so much & enjoy your reading here. I sail a small sail boat, a pocket cruiser. I have an Ibberson sailors knife. I wouldn’t leave the dock without it attached to my belt or jacket. I have used this knife for about ten years and it is still as new. One comment, my experience is different than yours in that I often use the marlin spike when doing rope work. My boat is a traditional sail boat and I find the marlin spike very useful when tying eye splices in mooring lines, fender lines, anchor lines, etc. The Ibberson is an essential safety item and a useful hardworking tool. thanks for your comment – and I have nothing more to add! Enjoy your sailing & fair winds.